Pigeons and doves comprise the family Columbidae. In everyday language the terms pigeon and dove are often used interchangeably, but ornithologists tend to reserve the word pigeon for larger species and dove for smaller ones. There is however no steadfast rules regarding the terms, and the common name of a species can therefore not be used to safely assert the size of the bird. Young doves and pigeons are usually referred to as "squabs." The species commonly known as just “pigeon” is the Rock Pigeon, which has established feral populations in cities around the globe. Pigeons and doves are found all over the world, except for the high Arctic, Antarctica with its surrounding islands, and the driest parts of the Sahara Desert. You will find the greatest variety in the Indomalayan and Australasia ecozones. The plumage of pigeons and doves varies a lot within the family and will give you a clue as to the feeding habits of each species. Generally speaking, doves and pigeons that search for grains on the ground tend to sport rather dull, camouflaging colours while fruit eating species that live high up in the trees are more brightly coloured. Some of the most flamboyant species of dove are the fruit doves belonging to the genus Ptilinopus. Many species of pigeon and dove have declined sharply in numbers in modern times (i.e. after the year 1600) and 10 species have become extinct due to human activities, while other species and variants have benefited from us and increased their ranges. Except for the Passenger Pigeon, all extinct species have been island species, such as the famous Dodo of Mauritius. Birds that colonize remote islands with few predators tend to loose much or their anti-predator behaviour over time, e.g. the ability to fly or the habit of building nests far up in trees. When Europeans brought cats, rats, pigs and other mammals to this type of remote islands many native animals, including pigeons and dove, usually don’t adapt fast enough to the new situation to survive. Other problems for pigeons and doves are habitat loss and hunting. Today, almost 60 species of pigeons and doves are threatened with extinction. A majority of them lives on tropical islands. The family Columbidae is traditionally divided into several subfamilies, but later research indicates that these traditional subfamilies do not reflect the true relationship of the species. A lot of taxonomic changes will probably take place within this family in the near future. Pigeons have been kept by man for several thousand years and in many different parts of the world. The most commonly kept pigeon is a domesticated version of the Rock dove, Columba livia. The care recommendations below pertain to domesticated Rock doves, and other species may have other needs. Always research your particular species of pigeon to find out its requirements. Unlike most other pet birds, pigeons are usually not kept in cages. Instead, they are commonly kept in separate houses, so called pigeon lofts. Pigeon lofts normally have specially constructed openings that allow the pigeons to come and go as they wish. A loft must also be sturdy enough to keep the doves safe from predators, especially during the night when the doves are resting. Pigeons in a pigeon loft need perches to rest on and since these birds can be quite territorial it is best to include a lot of perches when building a pigeon loft. If you can’t allow your pigeons to come and go as they please, e.g. due to complaints from neighbors, it is still important to give them the opportunity to fly. You can for instance build an enclosed area, a so called flypen, large enough for them to fly around and get their daily exercise. A person that is being exposed to certain proteins in the dust associated with a pigeon's feathers over long periods of time may develop hypersensitivity pneumonitis, a condition known as pigeon lung or pigeon fancier’s lung. This is a type of allergic reaction and the symptoms can be quite similar to asthma. A person normally has to be exposed to the proteins for several years before the condition becomes evident. Wild pigeons and doves can be divided into two main groups: seed eaters (granivorous species) and fruit eaters (frugivorous species). Seed eating species typically gather their food on the ground while fruit eating species tend to feed on fruits that have not yet fallen from the trees. Fruit eating doves and pigeons are usually skilled climbers and many species can be seen hanging upside down from tree branches. Quite a lot of species happily supplement their seed or fruit diet with other items if given the opportunity. Ground-doves and quail-doves are for instance known to catch insects, worms and other small animals, while several other species feed on snails. The Atoll Fruit dove eats not only insects but reptiles as well. City dwelling pigeons are often fed by humans. Some species are sexually monochromatic while others are dichromatic. This means that the difficulty of sexing doves and pigeons varies a lot depending on species. Doves and pigeons construct rather feeble nests from sticks and other debris. The preferred location varies between species and from habitat to habitat and you can therefore find pigeon nests on the ground as well as high up on ledges and tree branches. Domesticated pigeons are normally given nest boxes by their keepers, typically at least two nest boxes for each mated pair to avoid territorial aggression. Doves and pigeons normally produce one or two eggs per breeding and the male and female bird will both help rearing the offspring. Doves and pigeons aren’t mammals, but they do produce so called “crop milk”, a highly nutritious liquid used to feed the young. The liquid is secreted by a sloughing of fluid-filled cells from the lining of the crop. Unlike mammals, the male bird also secretes this “milk”. Young doves and pigeons are known as "squabs." After 7 to 28 days, depending on species, they leave the nest. Pigeons and doves can suffer from many different health conditions. If you suspect that your pigeon is ill, ideally contact a veterinarian specializing in birds. In domesticated pigeons, one of the greatest problems is a disease called canker which can lead to crippling or even death. This disease is also seen in wild pigeons and doves. Canker is caused by a protozoan named Trichomonas gallinae that spreads through contacts between pigeons, e.g. mating, billing, and feeding young. The organism can also survive in water and in damp locations. Two of the most noticeable symptoms of canker are a swelling in the throat and the development of a cheesy growth inside the mouth. If the disease is detected during an early stage, it is treatable with medicine. Individual birds are normally treated with tablets while larger flocks can need soluble powder. Other examples of fairly common health problems seen in pigeons are coccidiosis, E. coli infections, paratyphoid fever, pigeon pox, PMV-1(paramyxovirus), pigeon malaria, sour crop, worms (e.g. hairworms, roundworms, tapeworms, and gapeworms), louses and various mites (e.g. red mites, itch mites, and feather quill mites). The species Rock Pigeon was domesticated many centuries ago and has today been bred into numerous varieties. Carrier pigeons have been used to carry messages, especially in times of war, and doves have also been bread for their meat, for physical characteristics (“fancy doves”) or for use in ceremonies. The most famous varieties are probably the homing pigeon and the racing homer; two doves famous for quickly and accurately finding their way home when released in other locations. Doves and pigeons tend to have powerful breast muscles which have made them popular as food. In Jewish tradition, doves are considered kosher and they are the only birds that can be brought as a korban (animal scarifies). The Passenger Pigeon is the only non-island pigeon species to have become extinct in modern times (i.e. after the year 1600). The Passenger Pigeon was once the most numerous species of bird on the planet and one of the breeding colonies was estimated to contain over a hundred million birds as late as 1871. The species died out in 1914 after years of habitat loss and massive overhunting. It was used as food by poor people in the United States and was an inexpensive way for landowners to feed their slaves. 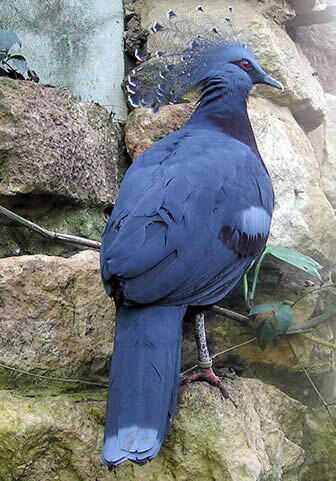 The largest pigeon species in the world is the Crowned Pigeon of New Guinea. This pigeon is almost as big as a turkey and can weigh 2-4 kg. The smallest species are the doves of the genus Columbina, which weigh as little as 22 grams. Many pigeons have received bravery awards and medals for their actions in war time. The French pigeon Cher Ami did for instance receive the Croix de Guerre, a military decoration given to units or individuals who have distinguished themselves by acts of heroism involving combat with enemy forces. Cher Ami delivered a message that helped save the life of 194 American soldiers during World War I, despite being shot through the breast by the Germans, blinded in one eye, covered in blood, and with a leg hanging only by a tendon. Domesticated rock pigeons have an expected life span of 15 years in captivity with occasionally individuals reaching an age of up to 35 years. In the wild, feral rock pigeons tend to live much shorter lives, often just 3-5 years.